As an undergraduate and postgraduate student he participated in excavations at Makronissos island, Kallipolis (Phocis), Eretria on Euboea, and Minoa on Amorgos. Between 1990 and 1995, and in 2001, he directed an intensive archaeological survey on the Cycladic island of Kythnos (mainly in the area of the ancient capital of the island, Vryokastro). In 2004-2005 he conducted a Geological and a Geophysical survey at Oropos. From 1996 until 2003, and again from 2006 until 2011, he directed the excavation at Skala Oropou, in northern Attica (Early Iron Age metalworking site), under the auspices of the Greek Archaeological Society, with funds mainly from INSTAP and the Psycha Foundation. Since 2002 he is directing the excavation of the University of Thessaly at the ancient capital of Kythnos (Archaic-Hellenistic sanctuary), supported also by the Municipality of Kythnos and the Ministry of the Aegean. Between 2004-2008 he directed on behalf of the University of Thessaly the excavation at Soros, in Thessaly (Late Archaic-Classical sanctuary of Apollo at ancient Amphanai or Pagasai). Between 2009 and 2011 he directed a survey and from 2012 - 2016 an excavation at the Early Iron Age fortified settlement of Kephala on Skiathos, perhaps to be identified with "Palaiskiathos" of the ancient sources. The 2012 excavation season was supported by INSTAP. In March 2015 he participated in the excavation of the "Sacred House" of the Academy of Athens, under the direction of the Ephorate of Athens. Lastly, from 2005 to 2011 he co-directed with Dr D. Kourkoumelis the underwater excavation of the ancient harbour of the town of Kythnos (the first underwater excavation to be conducted by a Greek University, in collaboration with the Ephorate of Underwater Antiquities of the Ministry of Culture). He also directed between 2010-2012 a project concerning the preservation of the traditional paths of the island of Kythnos (funded by the Prefecture of the Cyclades). His excavation projects have often become the focus of Greek and international media and were funded by numerous institutions: Oropos: Athens Archaeological Society, Institute for Aegean Prehistory (INSTAP), Psycha Foundation. Kythnos: Ministry of the Aegean, Prefecture and Municipality of Cyclades, I. Kostopoulos Foundation. 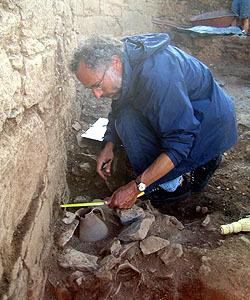 The study for publication of the Oropos excavation was funded by the EU program Pythagoras I and the Shelby White-Leon Levy Program for Archaeological Publications.